“Hala ka may aswang!” I overheard a neighbour admonish her toddler this morning. A smirk came almost involuntarily to my lips. That was as time-tested an admonition if ever there was one. I use to hear that an awful lot when I was small; and indeed Social Science books explained that the aswang was a mythical creature that was invented by parents of yore to coax children to go to sleep. Or was it? Because to this day, people are as likely to scare each other with aswang tales as our ancestors did long before the age of electronic entertainment. For instance, there was this item in the regional edition of TV Patrol earlier this week which I totally ignored because I thought it was just another aswang story. But apparently, because of social media, the spook story rather went viral, and even made it to the national news. The aswang is so deeply ingrained in our culture that most of us are modern enough to know that there is probably no such thing, something in the backs of our minds likes to keep our options open just in case. 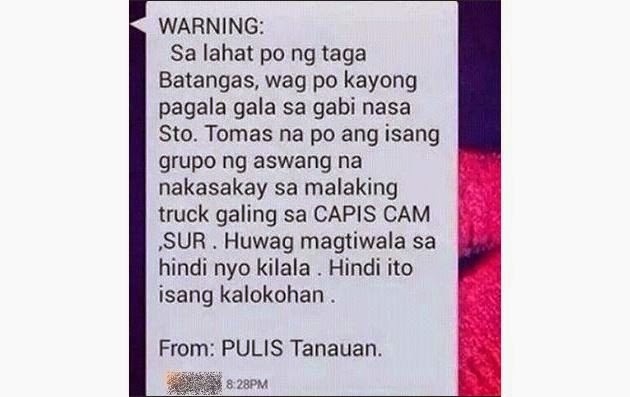 “WARNING: Sa lahat pô ng taga Batangas, ‘wag pô kayo pagalâ galâ sa gabi. Nasa Sto. Tomas na pô ang isang grupo ng aswang na nakasakay sa isang truck galing sa Capis Cam Sur. Huwag kayo magtiwalâ sa hindî n’yo kilala. Hindî ito isang kalokohan. Now that I come to think about it, I did wonder why the neighbourhood where I live went quiet earlier than usual the past few nights. I gave this no real thought because the northeast monsoons coincidentally started to blow and I thought people retired early because of the cooler nights. Screen capture from TV Patrol Southern Tagalog on FB. Unless people were taking the aswang story a little too seriously; and in our culture, aswang stories rather tend to spread like wildfire. But talk about bad jokes. I tried Googling ‘Capis’ and ‘Camarines Sur’ and unless there is, indeed, an obscure little locality by that name in the province, my guess is that whoever posted that aswang story got his or her Philippine geography completely wrong. Whoever it was probably was thinking of Capiz instead; and Capiz, if you did not already know, is a province in the island of Panay. The province, unfortunately, is often unfairly thought of as one where a lot of these aswangs and witches supposedly live. This unfair branding is by no means unique. When I was young, I used to hear people speak in the same unflattering terms about Lian, this obscure little town in Western Batangas. The aswang in Batangas story, therefore, has no novelty whatsoever. 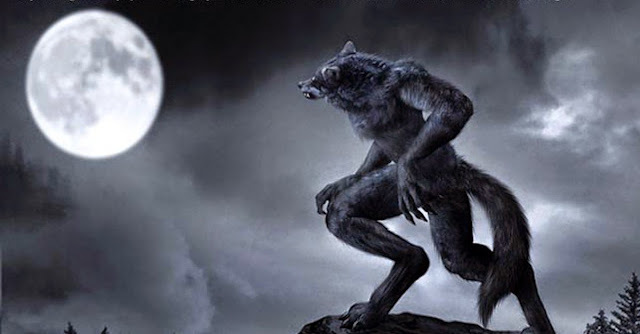 In fact, about a year ago, another neighbour who worked night shifts as security guard told me of an aswang that was supposed to prowl nights in this barangay just on the outskirts of Lipa City poblacion. A couple of years back, one of my former players said their neighbourhood lived in fear of an aswang that was supposed to have arrived in their municipality. I have yet to hear a first-hand story about the aswang. Since I was small, every aswang story that I heard was invariably accompanied by the universal disclaimer ‘daw.’ In other words, the stories inevitably spread through the grapevine. No different, I suppose, from the vampire stories that made it to television and newspapers in the seventies when I was in college. According to the stories, vampires arrived on a ship at the Port of Manila – from Capiz, where else? Back in the day, nobody bothered to wonder why these vampires had to ride ships at all. Weren’t vampires supposed to have the ability to shape-shift into bats and fly? And why always poor, poor Capiz!? Aswangs, witches and vampires! What could its inhabitants have done in the past to have gained such an undeserved reputation? But back to this latest aswang story. The reason I hardly paid it any attention was because the Tanauan PNP, which was supposed to have issued the warning, immediately distanced itself from the post by stating that they had issued no such statement. And because TV Patrol Southern Tagalog airs before most people would have arrived home, then it is safe to say that many missed the PNP Tanauan disclaimer. Besides, these aswang stories have always spread by word of mouth probably since the very first time they were told. The aswang is so deeply ingrained in our culture that/while most of us are modern enough to know that there is probably no such thing, something in the backs of our minds likes to keep our options open just in case.